Every homeless Dog deserves the opportunity to find a loving, well-suited home for life. 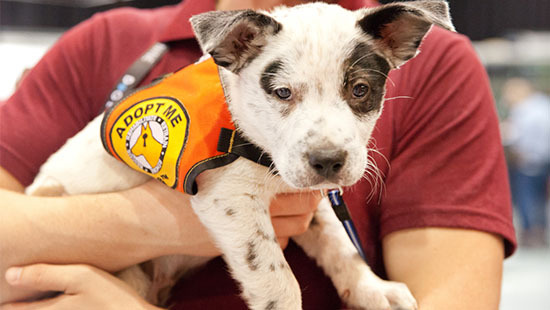 The 2018 Brisbane show brought back an even bigger range of rescue groups to help connect pooches with loving homes. The Dog Adoption Zone was a unique opportunity to learn all about Dog adoption with experts on hand at the show and dozens of Rescue Groups exhibiting. Visitors discover whether Dog adoption was right for them, what’s involved, how to find a suitable Dog and how to start the process. We are committed to raising awareness for adoption along with the help of our Dog Adoption Stage, and substantially increasing the number of abandoned and homeless Dogs placed in loving homes. By allowing hundreds of shelters to exhibit at the Dog Lovers Show since 2013 we have helped 2,000+ Dogs in need to find loving, well-suited homes. With your support the 2018 Brisbane Show helped contribute to improving the lives of many more Dogs like never before, so encourage you to spread the word and help us promote this important initiative.